The Tablets of Fate have been stolen. Lord Ao, creator and ruler of the gods, is furious. And the Earth will be made to suffer the price of his rage as he banishes the gods to the realm of humans and elves in the latest of the DC/TSR comics line, AVATAR. The gods will stop at nothing to recover the stolen relics and appease Lord Ao's anger...and the gods help any human (or other being) who gets in their way. Written by Barbara Kesel, with art by Dameon Willich, Monika Livingston and Tom Romano. Painted cover by Willich. 96 pages. New Format. Cover price $5.95. 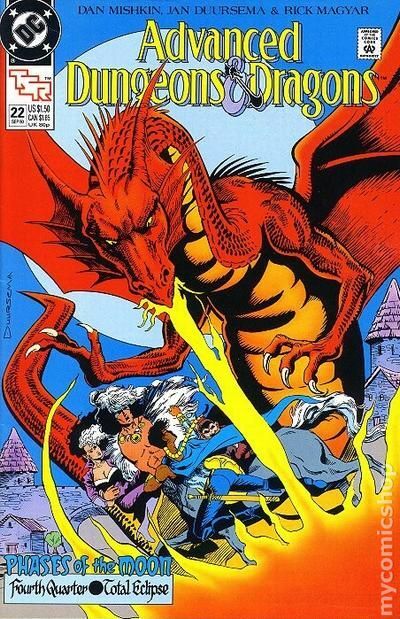 Elminster the Sage is lost in the labyrinthine folds of magical chaos as the Realms quake in crisis...and Midnight, Adon and company stand trial for Elminster's murder. 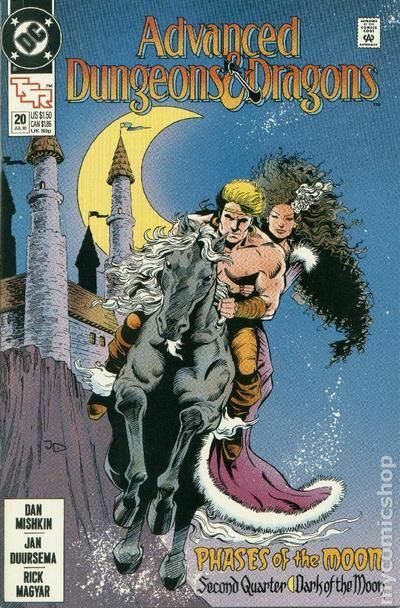 Written by Barbara Kesel, with art by Dameon Willich, John Nyberg and Todd Hamilton. Painted cover by Willich. 96 pages. New Format. Cover price $5.95. With the first Tablet of Fate in their possession, Midnight and her allies must now find the second Tablet in Waterdeep's City of Splendors before Cyric or Myrkul, god of the Dead, find it and use it for their own malevolent ends. Written by Barbara Kesel, with art by Dameon Willich, Jerry Acerno, Pam Eklund, Todd Hamilton, Jan Harpes, John Nyberg and Mickey Ritter. Painted cover by Willich. 96 pages. New Format. Cover price $5.95. An Avatar Story! Part 1 of 4. "Fallen Idols!" Story by Jeff Grubb. Art by Rags Morales and Dave Simons. It is "The Time of Troubles." 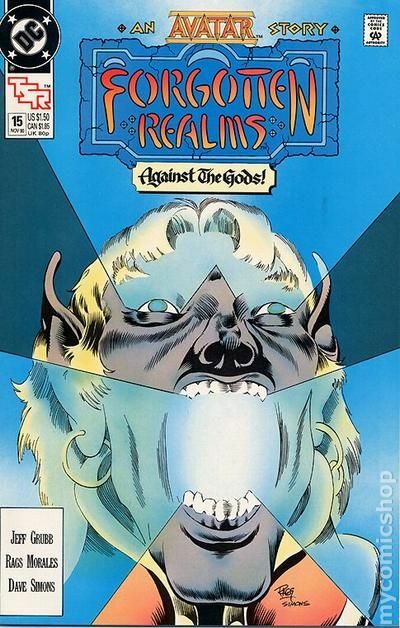 This is the omen Vartan was warned about (see Forgotten Realms (1989) #9). Gods now walk among the mortals of the Forgotten Realms. Magic is out of control, and strange creatures roam the land. This is the tale that rocked the Realms to its very foundation. Things turn upside down for the crew of the Realms Master when the elven god Labelas usurps Vartan, body and soul, and uses the cleric as his earthly avatar. 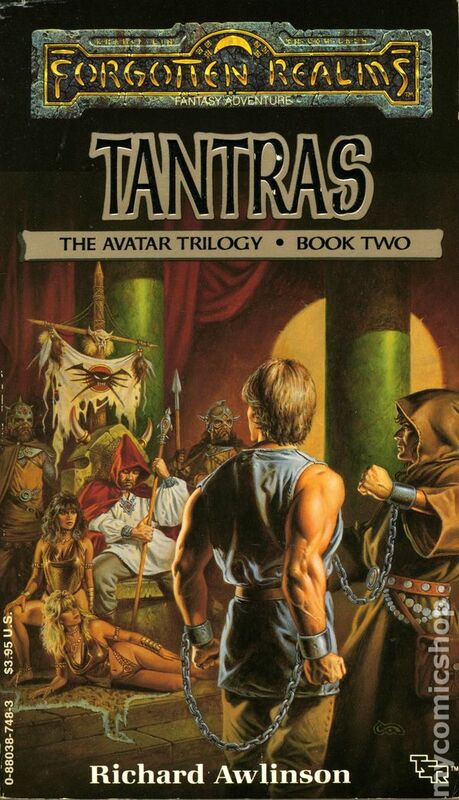 NOTE: The whole story of "The Time of Troubles" is chronicled in the Avatar Trilogy: Shadowdale, Tantras, and Waterdeep, novels written by Richard Awlinson and published by TSR. 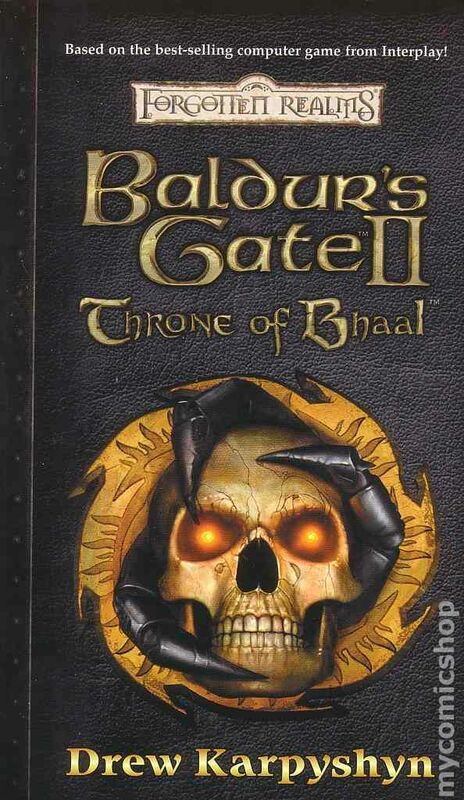 The affects of this story are still felt in the Forgotten Realms to this day and are explored in the computer games Baldur's Gate and Baldur's Gate II: Shadows of Amn. Cover price $1.50. An Avatar Story! Part 2 of 4. "Mad Gods and Paladins!" Story by Jeff Grubb. Art by Rags Morales and Dave Simons. "The Time of Troubles" are here. The Tablets of Fates have been stolen and the gods have been cast out of the heavens. 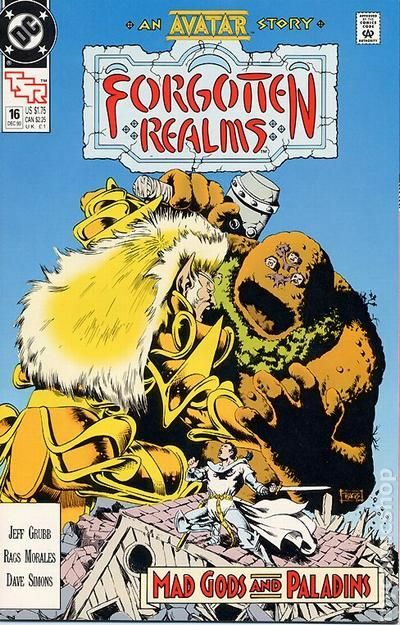 This is the omen Vartan was warned about (see Forgotten Realms (1989) #9). Now, Labelas, Vartan's deity, is using the cleric's body as vessel to walk among mortals, and the crew of the Realms Master is powerless to stop him. 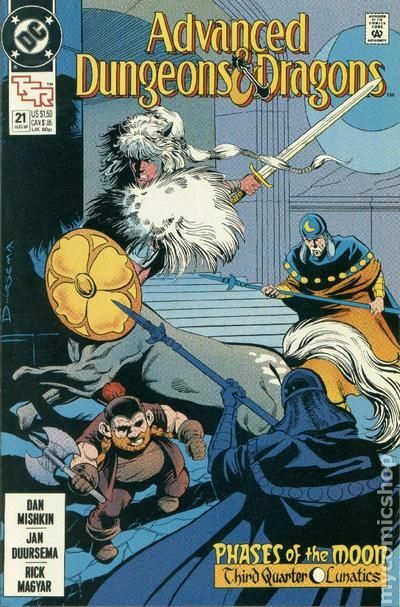 Things get worse when Labelas' rival, Enoreth the dwarf deity, shows up. When gods make war, mortals always lose. Cover price $1.75. An Avatar Story! Part 3 of 4. "Divine Rights!" Story by Jeff Grubb. 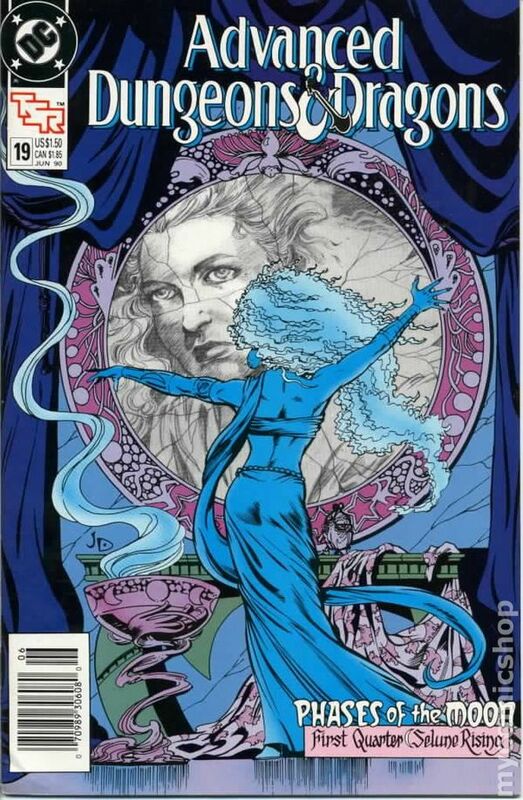 Art by Tom Raney, Jerry Acerno, and Mickey Ritter. "The Time of Troubles" continues. 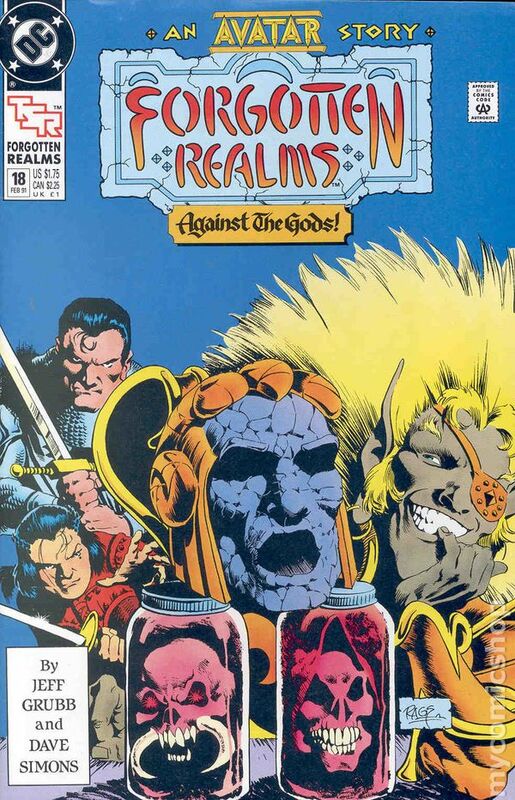 The Crew of the Realms Master are naught but puppets on a string, and the elf deity Labelas is the puppet-master. 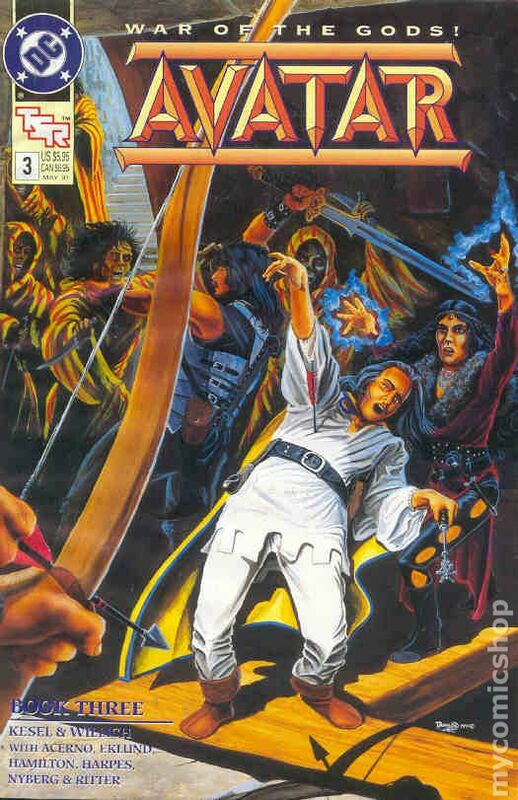 When Labelas reveals his master plan to storm the Gates of Heaven, using the Realms Master itself, the heroes are horrified and powerless to stop it. Cover price $1.75. An Avatar Story! Part 4 of 4. "On Earth as is in Heaven!" Story by Jeff Grubb. Art Dave Simons. "The Time of Troubles" concludes in this tragic tale of heroism. 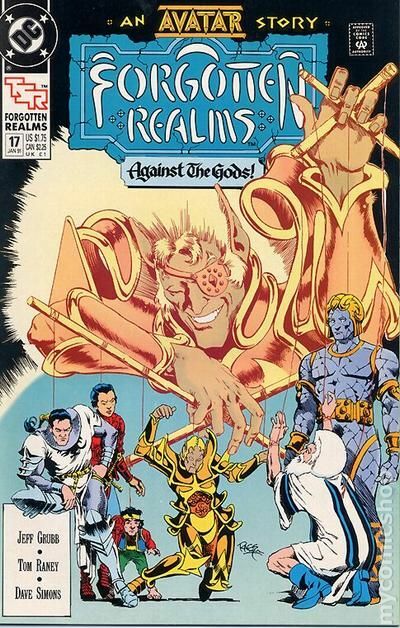 Even if the crew of the Realms Master can somehow defeat the elf god, Labelas, they can't stop their collision course with the Gates of Heaven and its protector, Helm the God of Judgement. This is a turning point in the lives of our heroes. 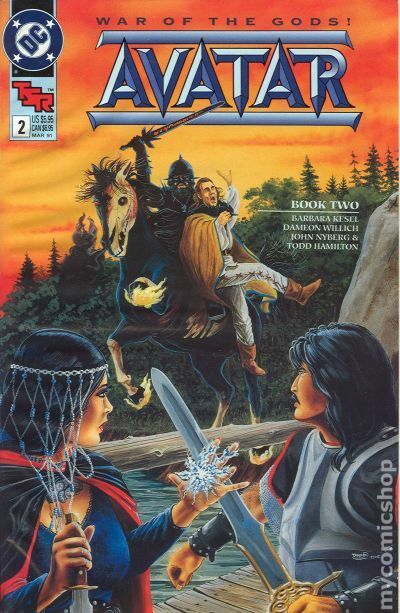 NOTE: The whole story of "The Time of Troubles" is chronicled in the Avatar Trilogy: Shadowdale, Tantras, and Waterdeep, novels written by Richard Awlinson and published by TSR. 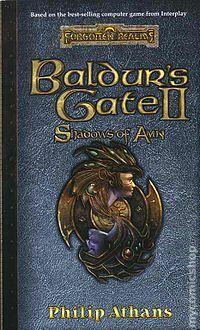 The affects of this story are still felt in the Forgotten Realms to this day and are explored in the computer games Baldur's Gate and Baldur's Gate II: Shadows of Amn. Cover price $1.75. Published Apr 1989 by TSR. 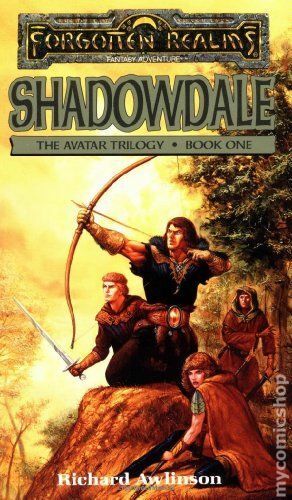 Book 1: Shadowdale - 1st printing. By Richard Awlinson (pen-name for Scott Ciencin). Cover by Jeff Easley. Welcome to the Time of Troubles. Magic has gone crazy, strange, terrifying monsters stalk the land, and the gods have been banished form the heavens to walk among mankind. The fabled Tablets of Fate, an artifact that holds the secrets to the cosmic balance between good and evil, have been stolen. 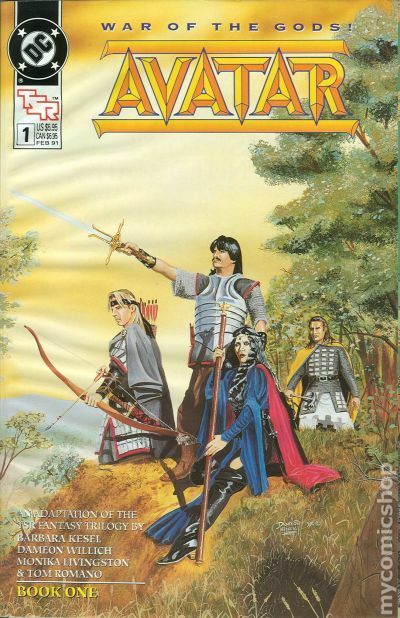 Now it is up to a quartet of mortal adventurers to seek out these Tablets and restore order to the Forgotten Realms. However, death lurks in the shadows and seeks to thwart their every move. This is the tale that changed the face of Faerûn forever! Softcover, 4-in. x 7-in., Text Only. Published Jul 1989 by TSR. Book 1: Shadowdale - 2nd and later printings. NOTE: Covers on reprints may vary. Published Jun 1989 by TSR. Book 2: Tantras - 1st printing. Welcome to the Time of Troubles. Magic has gone crazy, strange, terrifying monsters stalk the land, and the gods have been banished form the heavens to walk among mankind. Gods destroy gods and their war threatens to wipe out all the mortal races of the Realms. Book 2: Tantras - 2nd and later printings. NOTE: Covers on reprints may vary. Published Aug 1989 by TSR. 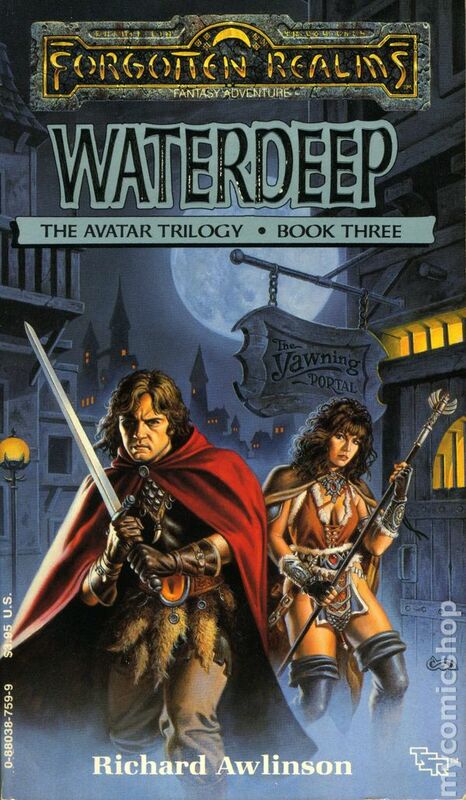 Book 3: Waterdeep - 1st printing. By Richard Awlinson (pen-name for Troy Denning). Cover by Clyde Caldwell. Welcome to the Time of Troubles. Our heroes have one Tablet but now they must venture into the City of Splendors and face down the gods themselves for the sake of all the Realms. Who will make the ultimate the sacrefice, who will be a traitor, and who will ascend to godhood? Don't miss the stunning conclusion to the tale that changed the face of Faerûn forever! Published Oct 1989 by TSR. 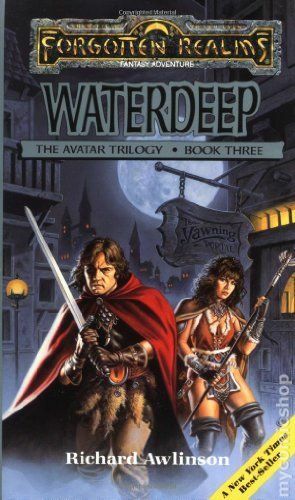 Book 3: Waterdeep - 2nd and later printings. NOTE: Covers on reprints may vary. Published Sep 2000 by Wizards of the Coast. 1st printing. Adapted by Philip Athans. based on the hit video game sequel. Our hero's journey is not done. Now that he knows the truth about his dark heritage, there are very powerful enemies waiting to exploit him. Sept up in a campaign involving tyrant wizards, vampire covens, a thieves war, and revenge seeking assassins, our hero and his intrepid group of friends will have to work together if they plan to survive. Softcover, 4-in. x 7-in., 256 pages, Text Only. Cover price $6.99. 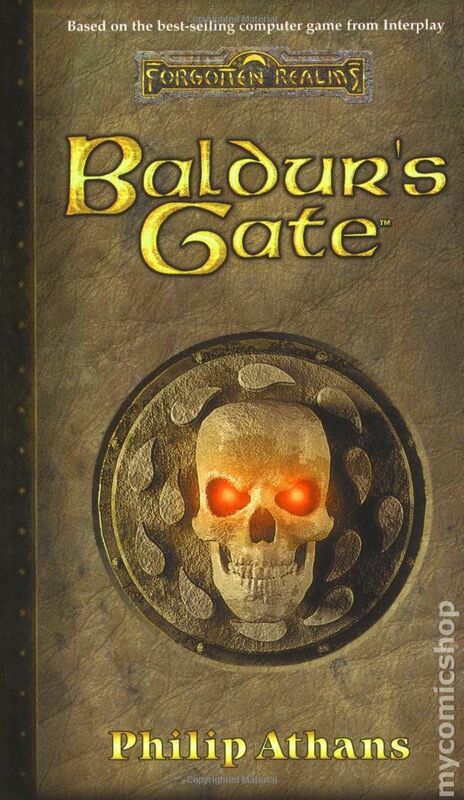 Published Sep 2001 by Wizards of the Coast. 1st printing. By Drew Karpyshyn. Death to the Children of Bhaal! On the run and hunted by everyone in Faerûn, Bhaals offspring are being wiped out. Instead of ridding the land of evil, each kill gives more power to a vicious group of Bhaalspawn intent on returning their father to the world. Follow the ultimate battle of the children of Bhaal in this thrilling novel based on the computer game from BioWare and Interplay! Softcover, 4-in. x 7-in., 246 pages, Text Only. Cover price $6.99.